Hello, my name is Shad Leeder, this post is number 4 of 4 in a series sharing a brief history of Leeder Hunting. 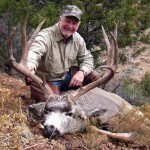 From a guide and outfitters point of view, the late 1990′s and the early 2000′s had to be one of the high points for elk and mule deer hunting in Nevada. 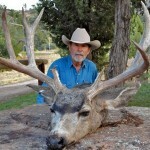 Trophy bull elk and mule deer bucks were plentiful. 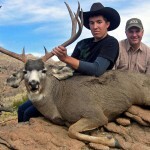 Nevada Department of Wildlife was able to allow more elk and mule deer tags creating more potential hunters/clients available to a guide or outfitter. 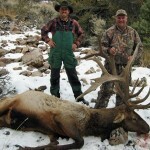 This same period of time was also great for trophy bull elk hunting in Utah where hunters were harvesting huge bulls throughout the state. 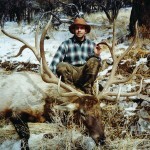 This created many opportunities for our clients to harvest some great trophy elk and mule deer. 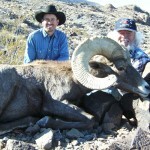 During the first decade of the new century, desert sheep hunting in Nevada and Utah was good and steadily getting better. 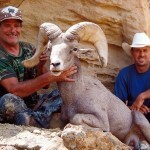 The 1990′s were a very drought stricken time in Utah and Nevada but as the 2000′s went on the drought gave way to some very moist years allowing for much better horn growth on the desert bighorn rams. This became more evident as the years went by during the 2000,s. 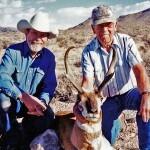 The same trend was evident with our pronghorn antelope during this time as well. 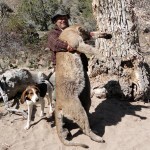 Our mountain lion hunting still remains very successful although Mt. lion populations have steadily gone down for the past two decades. After forty years of hunting Mt. 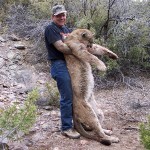 Lion in Utah and Nevada we have first hand knowledge of population trends of the Mt. Lion in our area. We have always adjusted our harvest numbers based on the Mt. Lion population trend in our areas. We are hopeful that the proper decisions will be made by wildlife managers to help the Mountain Lion populations improve during the next decade. No matter what happens, we will always offer a top quality lion hunt to all of our clients. 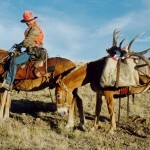 Over our first four decades in the guide and outfitting business we have learned a lot. We will continue to learn and apply our knowledge towards producing the highest quality hunt available to all of our clients. The future of our business is bright and we look forward to the next four decades with high expectations.